Singapore is a very clean, organized, futuristic city. I think it may be one of the most organized places in the world. It is a successful scale model, a preview of what the future will be like. Everything is clearly labeled and efficiency is king. In one of the malls, there were signs by the restrooms telling you how many minute’s walk it is until you will reach the next restroom. After spending a few weeks in chaotic India, we arrived in a place that was the polar opposite – providing a very amusing juxtaposition of extremes. We spent three days in the Little Red Dot, and with the help of a few friends, I think we managed to see and do most of what there is to see and do. We explored Chinatown, trolled through Little India, smoked shisha on Arab street, browsed the hip little shops on Haji Lane. We ate everything we could at Hawker stalls, walked through many shopping malls, and took an afternoon nap in the grass on the Esplanade by the Merlion fountain. We had drinks at Clarke Quay and watched an awesome local cover band. We even ventured one evening into the Red Light district, which was definitely one of the more ‘real’ and authentic parts of the city. Our host brought us there so we could see a glimpse of what Singapore was like before the glossy high rises and endless malls took over. 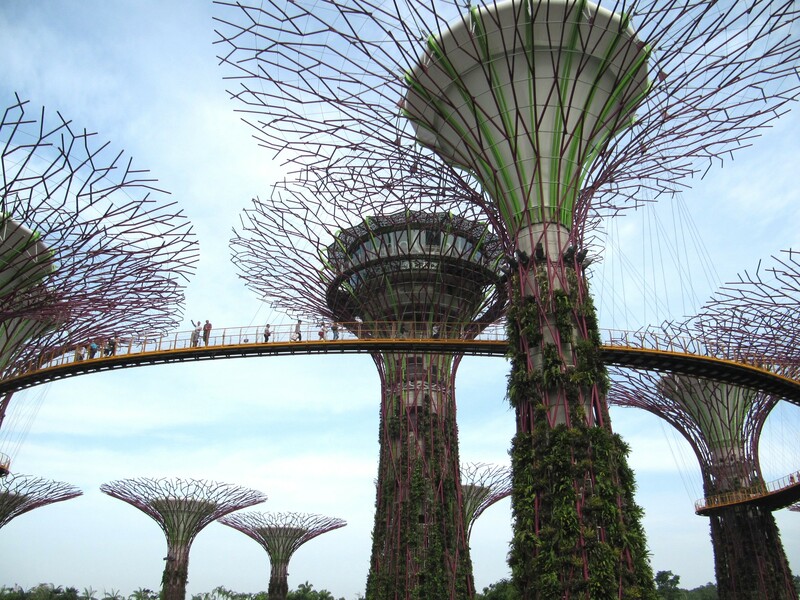 The futuristic structures of Gardens by the Bay look like something out of a Star Trek episode. 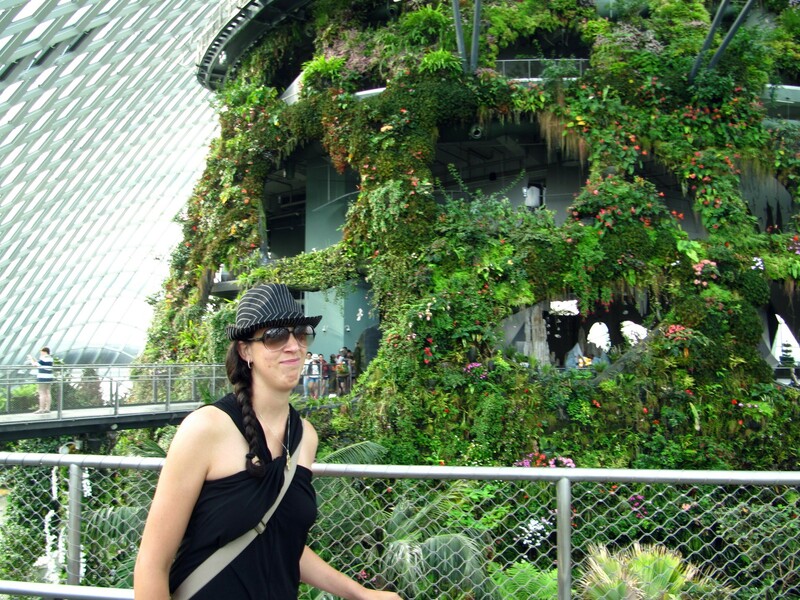 We admired the Marina Bay Sands hotel and strolled amongst the futuristic flora landscapes of the Gardens by the Bay. We climbed up the world’s tallest indoor waterfall in the Cloud Forest (it was not actually cloudy in there), a place that highlighted another defining characteristic of the city: almost everything is artificial, man-made. Jamie is not impressed by the Cloud Forest. 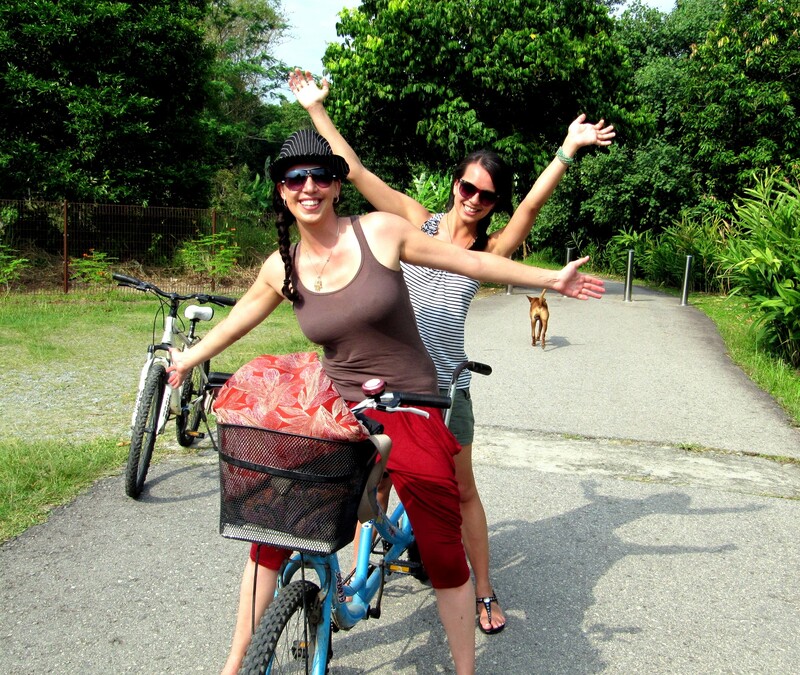 On our last day we decided to venture out of the city to a small island off the coast called Pulau Ubin. This was one of the coolest and most fun parts of our stay in Singapore. It also allowed us to see a little bit the simple life that existed before a maze of escalators moved in. 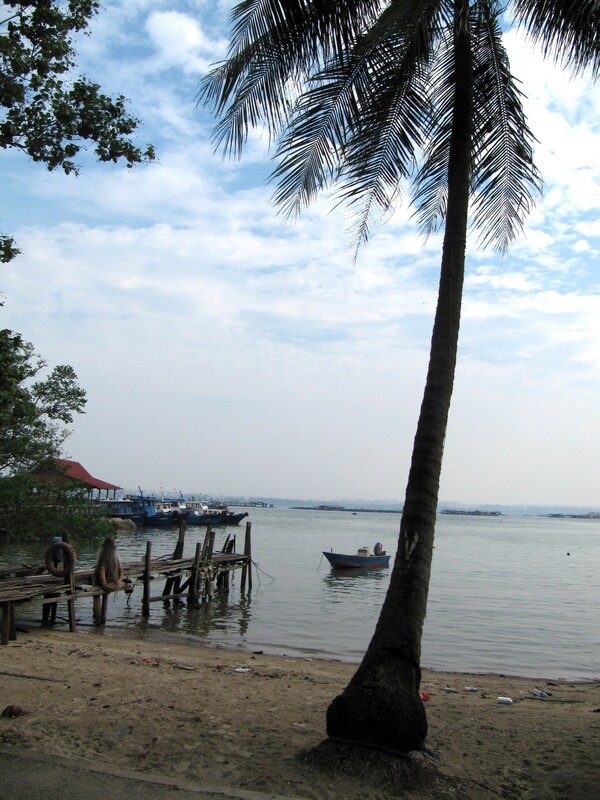 A quiet scene on Pulau Ubin, a welcome respite from the bustling city. Our local Singaporean friend, Rob, offered to join us on the trip, and we were all happy to get a little outside the city and enjoy some nature. It wasn’t easy to get to — we had to take a few metro lines to reach the far east side of town and then transfer to a bus. A long bus ride through suburbs and we reached the town of Changi Village to catch the boat to the island. There is no schedule for the boats, instead the ‘Bum Boat’ operators only take people over when there are 12 passengers to fill the boat. So you just wait in the ferry terminal until enough people queue up for the trip. 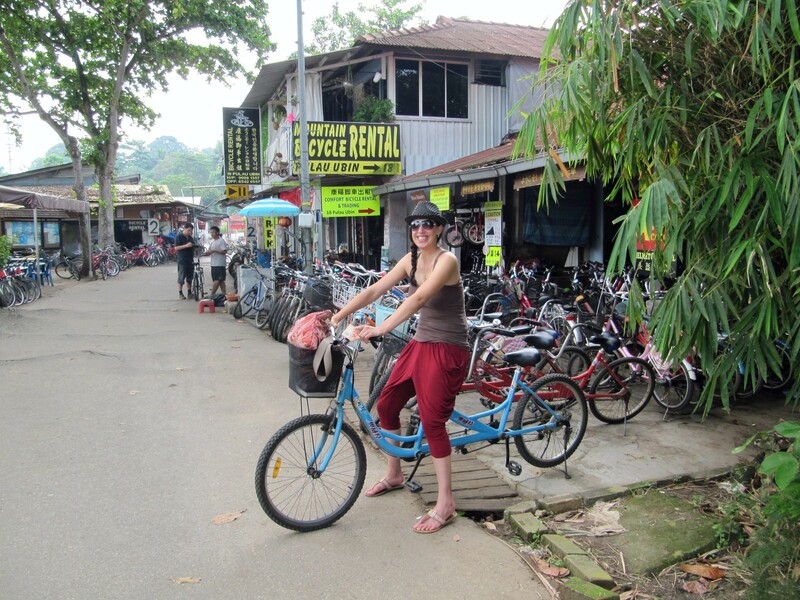 After a short ride, we arrived at the small harbor of Pulau Ubin, where oyster farmers and local fisherman milled about. There are a few small restaurants and bodegas in the village, and a bunch of bike rental shops. There were no new buildings or high-tech anything. It was a lovely, peaceful, friendly little fishing village. We had found the authentic feel we were looking for. It was a place that seemed untouched by time. We saw some people on a tandem bike, so of course I insisted that Jamie and I rent one of those. This became interesting when we later found out that the bike paths on the island were actually mountain biking trails, some of them quite steep and rocky — not the best terrain for a tandem. So we set out to explore the island and have some fun. Bicycle built for two!! We wanted to get a 3 person bike but they didn’t have em. We navigated the terrain as best we could and stayed away from the double-black-diamond ranked trails. There is a big quarry in the middle of the island and some small beaches and wetlands. The paths around the island were as scenic as they were serene — we rarely crossed paths with other day-trippers on our ride. 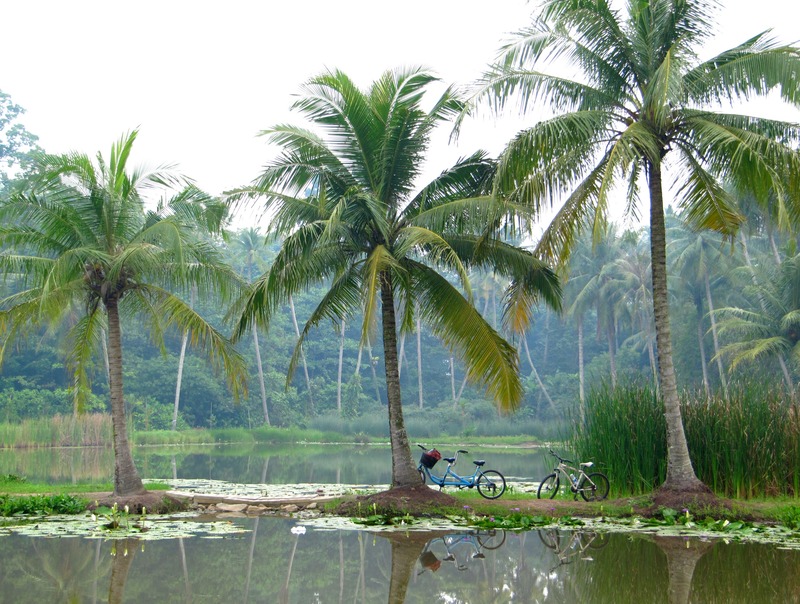 Bikes and palm trees at the lotus pond. 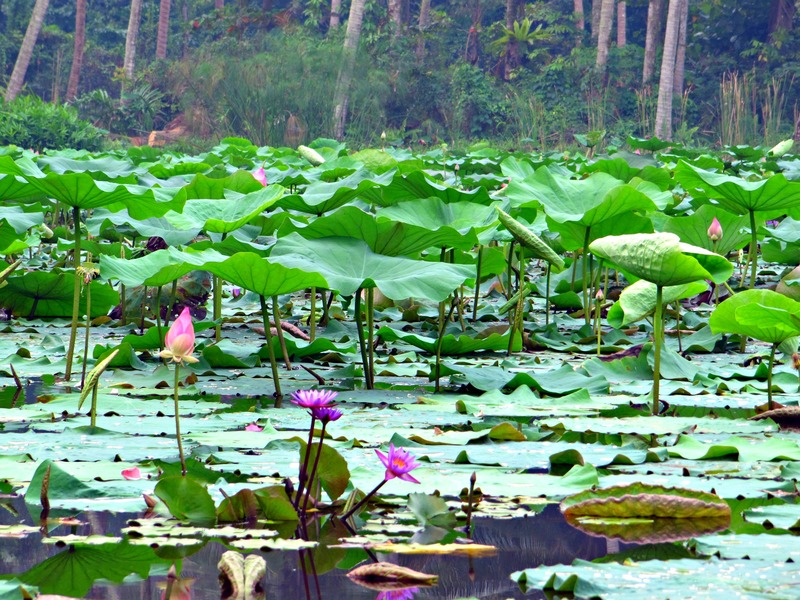 We took a wrong turn on our way back to the village and happened upon this amazing lily pond and lotus garden. There were two large lotus pond areas with a path along the middle lined with a few palm trees. Beautiful imagery at the hidden lotus garden on Pulau Ubin. It was truly something out of a fairytale. Would be an amazing location for a photo shoot, if you’re into that sort of thing. 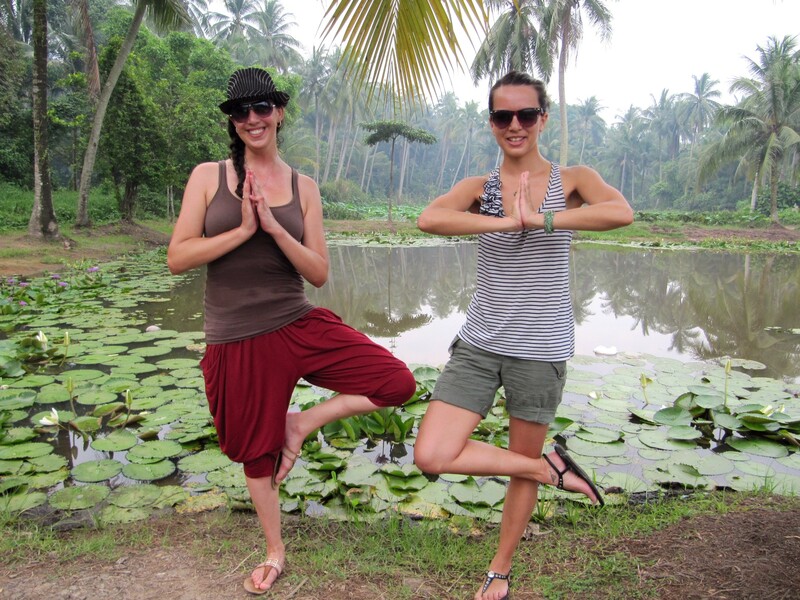 Attempting a half-lotus at the lotus pond. Fantastic pictures! 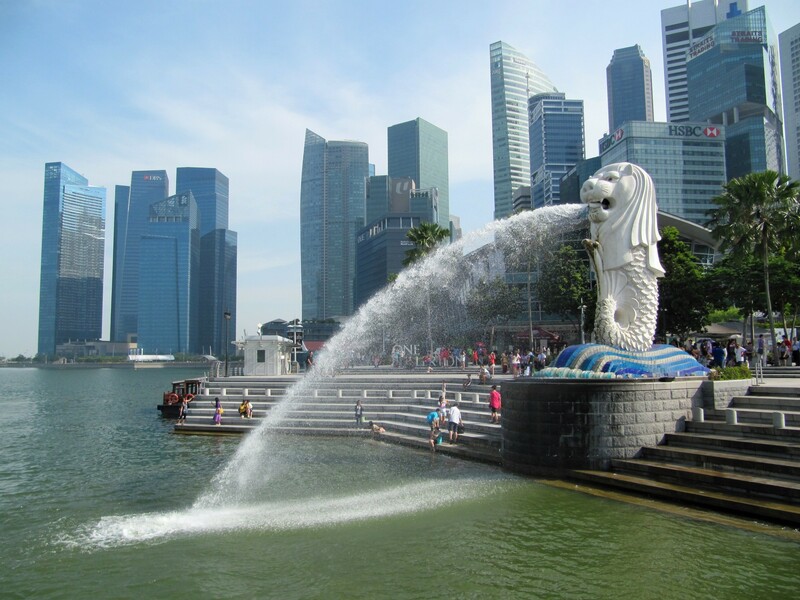 Kathy said that when we were in Singapore in 1973, Merlion was there, but no futuristic city!